After its original sold-out run at the Royal Court and transfers to The Public Theatre, New York, Dublin’s Abbey Theatre and The MAC Belfast; David Ireland’s black comedy Cyprus Avenue returns for a limited four-week run. Eric Miller is a Belfast Loyalist. He believes his five-week old granddaughter is Gerry Adams. His family keep telling him to stop living in the past and fighting old battles that nobody cares about anymore but his cultural heritage is under siege. He must act. The story of one man struggling with the past and terrified of the future. Directed by Royal Court Artistic Director Vicky Featherstone, original cast member Stephen Rea will reprise the role of Eric Miller, for which he won Best Actor at the Irish Times Theatre Awards in 2017. 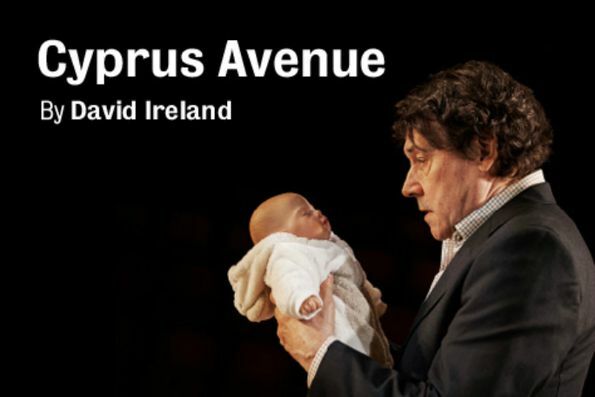 Cyprus Avenue won Best New Play at the Irish Times Theatre Awards and James Tait Black Prize for Drama in 2017. Cyprus Avenue is not available to book, please sign up to our newsletter for updates and offers on forthcoming and available shows.